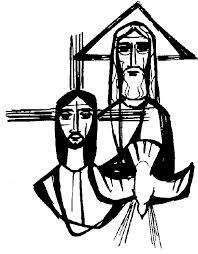 This Sunday ( May 26th) is Trinity Sunday. Preaching at St Mary’s Priory recently St Michael’s Ordinand Tom Bates reflected on the Trinity. In the Eastern Church Theology is expressed not in literary form as in the West, but in art, and I’ve brought a picture of an icon to share with you today. It’s a version of a very famous icon by Rubilev which I’m sure you’ve seen many times, which is commonly referred to as the Trinity. However this is not the Trinity in some heavenly landscape, surrounded by adoring angels and archangels and all the host of heaven. This is a depiction of the visit of the three strangers to Abraham at the oaks of Mamre in Genesis 18. You can just make out a green leafy shoot at the very back which looks a little bit like a stem of asparagus or something…well that is infact an oak tree, and to the left of it we can just see a very grand looking dwelling, which symbolises Abraham’s encampment. So very far removed from heavenly glory, here is a depiction of Godhead in a tent in the West bank, enjoying Abraham’s hospitality. I visited the oaks of Mamre myself earlier this year, as well as Hebron where the hospitality of Abraham still has a thriving culture today. Despite the incredibly high level of security checks to pass into the West Bank, once we arrived local people were keen to welcome us, and to extend to us hospitality after the example of their famous forebear. It was very moving to travel to a place where there is so much division and poverty, yet to be welcomed with such generosity. The icon depicts how the Trinity, relate to one another, and explores the idea of what it means to be a Godhead that is three in one. It gives us a glimpse inside the family life of the Trinity: the Father, the Son and the Holy Spirit. However there is something interesting about the perspective of the way in which this icon is written, and it reflects the idea that an icon is not an image, but a window. From this perspective we are not mere observers, but, as we enter the scene through this ‘window’, we are a part of this picture too. We take the place of Abraham, the host. I chose this edition of this icon because the bowl on the table appears empty. Abraham bent over backwards to entertain his visitors. He set all his household to work, making cakes and bread, preparing a fatted calf, curds and milk. He offered the very best of what he had. This icon is not just a picture of the Trinity, it is designed to encourage us to think about what it means for us to be in relationship with God. The empty bowl is a question to us. What do we bring to this relationship? Are we able like Abraham, to give back to God the best of what he has given to us? All of our readings today tell us something about what being in relationship with God is like and will be like in the future. In the reading from Acts we hear about the early church trying to understand what being in a covenant relationship meant for Christians. The psalmist tells about how being in relationship with God will bring about God’s reign on earth, and what that will be like, and in Revelation we hear of what life will be like in the ultimate reality of God’s kingdom in heaven, where God will be with us, no longer seen through a glass darkly as St Paul says, but face to face: The true reality of God. Recently I’ve been rediscovering the weight of the greeting ‘the Lord be with you’? I wonder whether we think about the enormity of what we wish upon one another when we say this? A whole host of biblical heroes at pivotal moments in their lives received that promise…and for them nothing was ever the same again. We know through the Scriptures that the Lord was with Isaac, and Jacob, with Moses and Joshua, with David and Jeremiah, and of course with the Blessed Virgin Mary. The Lord being with you has tremendous, life changing consequences….’Go and tell Pharaoh, Lead my people, bring me to my people, make me manifest, Immanuel, God with us. None of these are small easy things, but tasks which require the dedication of our whole self to God’s will. This greeting features in our liturgy, often as almost a throw away greeting, a polite way of saying good morning to the priest, but there is so much more to it than that, but in today’s gospel reading we are told not only that God will be with us if we love him and keep his word, but that he will make his home with us. ‘If anyone loves me he will keep my word, and my Father will love him, and we shall come to him and make our HOME with him.’ You learn a lot about someone by living with them. He’s not just visiting for the weekend, Not popping round for an hour on Sunday morning, Not even visiting in the way he visited Abraham. He’s moving in and he has a makeover in mind. The popular saying goes ‘ To live is to change, and to be perfect to have changed often.’ As Christians we might say ‘To live is to be changed, through repentance, to once again ally ourselves to God’s will instead of our own, and to be perfect is to do this, not by visiting him once a week for an hour, or promising to make more time for Him as one might the gym in a new years resolution. No, it is to make a home for Him in our hearts and to be constantly be informed and changed in our lives by our relationship with Him. In Acts 15 we hear about the concerns some people are having about the mark circumcision, the sign of God’s covenant with Abraham and his descendants, a rite of passage I witnessed in Hebron as Jews from all over Israel and the world still bring their children there to Abraham’s tomb to perform this ritual today. In Acts the early Christians were uncertain as to how to marry the Jewish culture of the Old Testament with the continuation of that promise, Christ, ‘the light to lighten the gentiles’. Did they too need to adopt this ritual to be a part of God’s covenant? But what is a covenant? Was it just a business deal between God and Abraham? A sort of gentleman’s agreement? I’ll scratch your back if you scratch mine? In the Middle East the connotations of the term covenant represent a sacred bond which brings someone into a family relationship with someone else. Perhaps the closest thing we have in our culture is marriage. Two individuals become one. Two families are united in love.In the Old Testament we read that God started off making a covenant with a few individuals. Adam and Eve, a couple. Then Noah and his family. Then with Abraham God extends his familial relations with a whole nation: His covenant people Israel, and through Jesus this inheritance comes to the whole world. We can see this relational idea in the language we use surrounding the Holy Trinity, God three persons in one. The Father, the Son and the Holy Spirit.. Through Jesus we are family, a part of the covenant people of God. This icon is not just a picture of an historical event, or even an odd depiction trying to explain a difficult piece of theology. It is, as it were, a reflection on the heart of human nature as God intended it. His home with us: A perfect relationship between God and humankind. A table prepared in the midst of the human heart where God and the individual can be family together. Where he by his infinite grace knows us as his children and, as Jesus taught us, we may in turn know him as our Father. Jesus said ‘If anyone loves me he will keep my word, and my Father will love him, and we shall come to him and make our home with him’. May that love be yours and mine, and may we truly know the glory of the Lord who makes his home with us and may we be continually changed, growing in his likeness and love that through him we may become the perfect realisation of his image for us. Amen. Sermon for St Mary’s priory, Abergavenny 5th May 2013. Following the death of our Treasurer Clive Bowker Jones we have had a reshuffle of Parish posts. At a meeting of the PCC last night (Tuesday) Robin Smith , formerly Vicar’s Warden was elected as Treasurer. Mrs Sheila Davies (Formerly People’ Warden) was appointed by the Vicar as his Warden. Mrs Janet Battersby JP (formerly Dep People’s Warden) was elected as the new People’s Warden and Robin Smith as her Deputy. 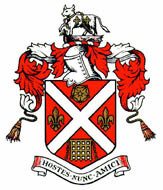 Robin Smith was also elected as a Priory Trustee, in the place vacated by Clive’s death. The PCC meeting opened with the Vicar, Fr Mark praying for Clive’s soul.His Requiem Mass will be held at St mary’s Priory Church on May 28th at 11am. We will host the Mayor of Abergavenny’s Civic Service this year at Christchurch, North Street, where the Mayor, Cllr Sheila Woodhouse is the People’s Sub Warden. The Service will be on June 2nd. Following a procession to the Church led by the Mayor and Town Council the Service will start at 3pm. The Choir of St Mary’s Priory Church will sing Jubilate Deo and Be thou my vision by Bob Chilcott. The Mayor will read from St. Mark’s Gospel and her Chaplain Fr Mark Soady will preach. St Mary’s has lost a good and loyal servant. 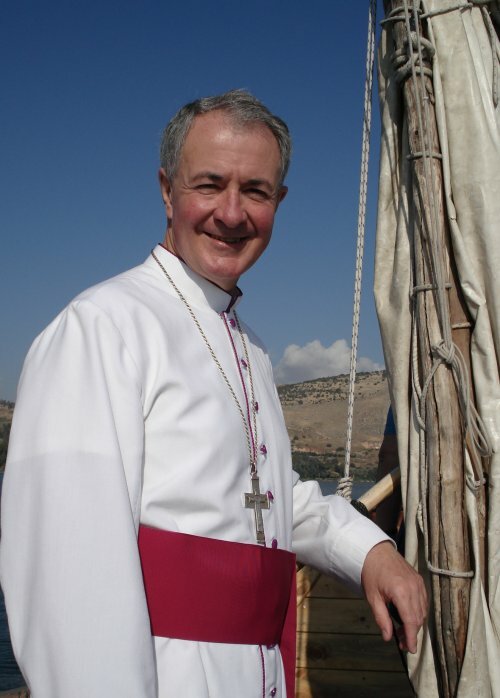 Clive stewardship of the finances and his time as Warden was only the tip of the Iceberg of what he did, he will leave A big hole in the life of the parish . My thoughts and prayers are with Sylvia at this time. Last Thursday, the Church celebrated the occasion when Jesus took his leave of the disciples, and commanded them to wait for the gift of power from on high. Next Sunday, we celebrate God’s sending of the Holy Spirit. As they waited, the disciples must have had a sense that they were on the brink of something new. They had given their lives to become wanderers with the Lord. They had become living witnesses of Jesus’ betrayal and execution, of his Resurrection and of God’s vindication of his Son, yet they could not have guessed where they might be led, or how God would support them in their witness. In our gospel reading today, Jesus prays for all his disciples, down from that first fellowship, that his followers may become bearers of “glory”, in the same way that he had revealed the glory of God to the world. Jesus had done this by proclaiming God’s grace in word and in action, in radical outreach and in divine power, and he prays in this reading that the quality of life of his disciples would be such as to make known God’s name, God’s character – a quality of life that would speak of the fullness of God’s glorious nature. Such a witness was the mission of the early Church, and our reading from the book of the Acts of the Apostles shows how Paul and Silas among others found themselves doing that in unlikely ways and unlikely places. The Church in Wales today inherits not just the witness of these first disciples and apostles, but of at least fifteen hundred years of witness to Jesus by the saints and disciples of Wales. Our forebears in the faith witnessed the Romans leave these shores, the Saxons and the Normans arrive. They have seen conquest, war, union with England, industrial revolution. They have seen decline and revival, the flowering of Catholic spirituality, and the passion of the Reformation. In every generation God has raised up those who make known the glory of the fullness of life found in Jesus. When the Anglican Church would not or could not, God raised up others, and we have been through separation and division, and yet we have also been drawn back towards relationship with one another because our true relationship is founded on the one Lord Jesus Christ. In every generation we have tried to work out what being a disciple of Jesus and a living witness to the name of God means. We have asked ourselves questions about the scriptures and our witness and our worship and our service. The world in its turn has asked questions of us about our way of life and our beliefs in ways which stimulate new thinking. Such questioning has never been more urgent than today, and as we approach the centenary of our disestablishment [our separation from almost a thousand years living as part of the Church of England] we are beginning to learn that we have to be less of an institution and more of a movement: that we have to recapture the spirit of those first apostles; uncertain what our role might be, but excited by the knowledge that Christ reveals the glory of God and makes his name known through our witness. Jesus called all people to turn their lives around in order to become ambassadors in God’s name, to receive from God’s hand the new heart of flesh, of compassion and love, to replace the hardened heart of life outside of God. He invites us into the glory of a fullness of life in which God’s name is made known through healing and justice and love. The worth of the Church in Wales depends entirely on our being ambassadors for that same glory today. Unless our lives reflect God’s love and glory, and we live the sort of life that he wants proclaimed, then the witness of the Church in Wales is hollow and without power. That is why we are talking today of “ministry” and of “calling”. There is not a person sitting in the congregation today who cannot offer ministry in God’s name to the world. God calls every one of us into the exercise of that individual service for which God has made us and equipped us. God calls every one of us to be a bearer of God’s name and glory for others. We would not be your bishops today, if we were not aware in our own lives that God has been merciful to us, and if we did not in some measure know that renewal of our hearts by God prophesied by Ezekiel and prayed for by Jesus. We have confidence that God has called us to this ministry and will sustain us, in the very same moment that each of us feels deeply unworthy of the task. 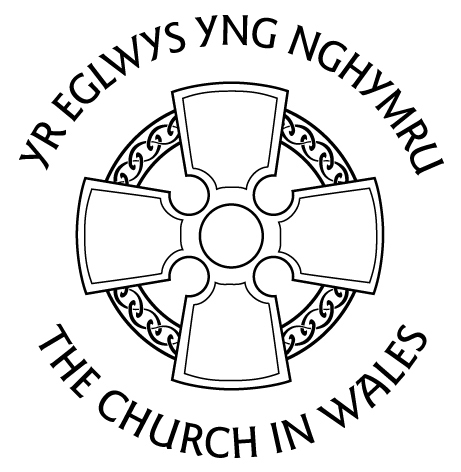 However, the question today concerns not just our vocation, but the vocation of every member of the Church in Wales. What has God called you to do and to be alongside us for his sake? How can we together make known the glory and love of God in our world? Today, we are asking you to join us in making God’s name known. Jesus prayed for us that we might reflect God’s glory and love, and we believe he calls us to become a people together, ready for ministry and service. Each member of our family has a place and a vocation to contribute and adventure forth in God’s name. The letter to the Ephesians speaks of God’s vocation: God “gave some to be apostles; and some, prophets; some, evangelists; and some, pastors and teachers”, and we could add “and some, priests and deacons and readers and lay ministers”. What gifts has God given you to equip you to make known his name? Isaiah heard the Spirit of God, saying: Whom shall I send, and who will go for me? Peter Lutter will give a Piano Recital on September 27.The Concert is also in aid the Dean Winston Memorial. Benjamin Britten’s Noah Ark will be preformed by the St Mary’s Priory Choir along with musicians from Henry VIII School and Caerleon Comprehensive School In July 21014.